Fargo Ribbon - Full Color (YMCFKO) Ribbon, 500 images. The ribbon is used to print in a variety of colors: yellow (Y), magenta (M), and cyan (C). The ribbon contains a fluorescing panel (F) which allows text or images to be visible only through the use of ultraviolet (UV) light. The (K) allows for black printing. The remaining overlay (O) provides an extra layer of protection for the card. 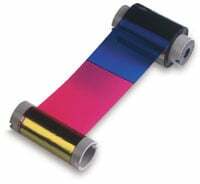 This ribbon is used to print text and full color images on one or both sides of the card. For best imaging quality, recommended for use on UltraCard I (PVC) and UltraCard Premium (composite) cards only. Compatible with DTC4500, DTC4500e. This part is also known as 045209. Thermal ribbons compatible with the Fargo DTC4500e. The Fargo 45209 is also known as Fargo Electronics	45209	.